Circa, the mobile news service that was co-founded and funded by Cheezburger Network CEO Ben Huh, launched the second generation of its platform on Thursday, including an Android version of the app — but the real meat of the launch is Circa’s focus on breaking news, and its plan to become a kind of one-stop mobile wire service for major news stories. 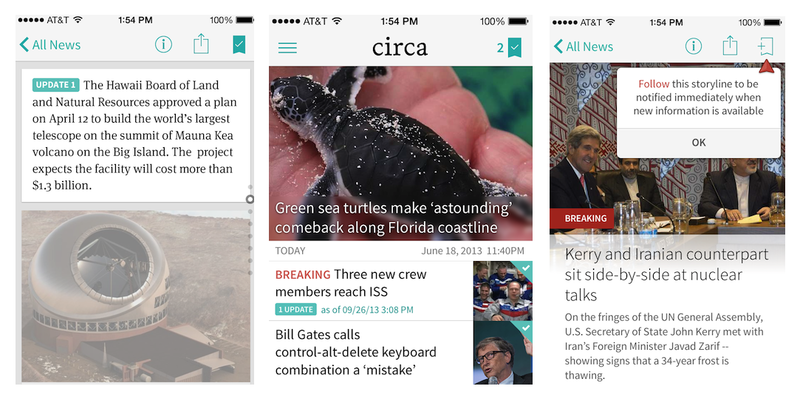 Co-founder and CEO Matt Galligan said Circa will now start offering breaking news alerts, combined with the service’s existing ability to “follow” and get updates to a story. Until now, Circa has been available only on the iPhone — with short shareable clips also available on the website — and it has focused mostly on creating packages of news related to major stories. So for example, Circa editors pull together comprehensive reports on events such as the shutdown of the federal government or the unrest in Syria, which are written based on existing news stories from other outlets (which Circa lists underneath each story). Readers are alerted through the app when there are new updates added. There are other services that also offer mobile-focused breaking news: a service called Breaking News, for example — which started as a Twitter account and was then acquired by NBC — also offers news alerts both on Twitter and the web, as well as through its mobile apps. Circa’s “follow” function, however, is somewhat unique. And Galligan says the ability to know when someone has seen updates to a story provides the service with valuable information when it comes to customizing what it shows users. For example, he says, Circa knows when someone has seen a specific update, so if that update needs to be corrected then the app could theoretically push out a correction to only those readers who saw the original mistake. This would solve the problem that many journalists have with Twitter as a news source — or the “citizen journalism” that comes from sites like Reddit — which is that it’s difficult, if not impossible, to ensure that people who saw or re-shared a false report also see and share the correction. The potential of that kind of customization goes even further, Galligan says: what if users could indicate to Circa that they were willing to see more unconfirmed or speculative news as part of the content within the app? Then the service could send out unverified reports only to those readers who had specifically requested to be added to those lists — and if corrections or updates needed to be sent, then they would only have to go out to a small subset of the userbase. Ad Age magazine recently asked Huh how Circa planned to make money. “I have no idea,” he said. “I’m sure [co-founder and CEO Matt Galligan] and his team will go figure that out at some point.” Could customization of the kind that Galligan describes be part of the answer? More than likely, I think. Circa has raised $2.4 million in seed funding from a group of investors including Quotidian Ventures, Lerer Ventures, Dave Morin, Matt Mullenweg and Gary Vaynerchuk. Looks nice. But sharing to facebook does not share the title of the story. It simply says “Circa news” with a link to the story. Not very informative that way. @geepee that should no longer be the case, give it another try now. Very happy to give Circa a home on my Android phone!